Ross Gray and Keith Lough had the visitors two up inside the opening ten minutes. An accurate Lee Currie free kick made it three before Lough grabbed his second all within the first half an hour. Conor McLaren got one back for Swifts before the break and Aaron Whitehead made it 4-2 in the second half but Rose were more than comfortable. Rose can clinch the Conference B title on Friday night should the manage at least a point against Dunipace and if they start like they did here then that looks more than likely. The opening goal came after only six minutes as Jon Brown’s cross found Gray who dispatched the ball into the corner via the post. Lough made it two just three minutes later when he got the deftest of touches onto Dean Brett’s delivery. 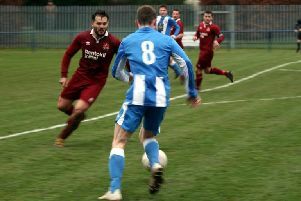 Currie’s free kick on 19 minutes made it free when he clipped the ball into the corner from an acute angle on the right. Lough netted his 20th goal of the season when he latched onto Gray’s through ball and calmly slotted the ball under the advancing Mark Mitchell in goal for 4-0. 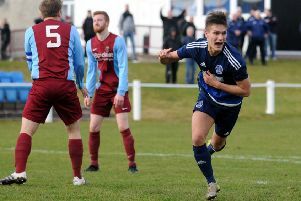 Connor McLaren was the Jeanfield marksman who pulled a goal back for the Perthshire men on 25 minutes, a long diagonal found him behind the defence and he chested the ball down before firing low into the corner. Bonnyrigg continued to rule the roost in the second half with the tie done and dusted and another Keith Lough chance was headed off target. With some 15 minutes left for play a slip by keeper Bryan Young saw Whitehead get a touch to score at 4-2 as the game petered out to a comfortable finish for the Rose. Bonnyrigg Rose: B.Young, Brett, Brown, K.Young, Horne, Hoskins, Turner, Stewart, Lough, Currie, Gray. Subs: Murrell, Swanson, Moyes, keeper Mike Andrews.